While much of the recent media coverage of the manufacturing economy has been negative, one sector of the economy has been on a definite upswing: Renewable energy generation. Unfortunately California has been outdone in recent years – in spite of having some of the most advanced public policies for renewables – due to the surge in wind power development by states such as Texas and Iowa. Now however a spate of good news is putting California back on the map when it comes to large utility-scale renewable energy projects — particularly those projects that tap the sun as a fuel source. Just last week, the largest Concentrated Solar Power (CSP) plant in the world being developed by Solar Millennium was approved by the California Energy Commission (CEC). This week, yet another project by BrightSource Energy, known as Ivanpah near Needles in San Bernardino County, also took a major step forward. In addition, several similar projects, deploying a variety of cutting edge CSP technologies, are expected to get the green light before the end of 2010. 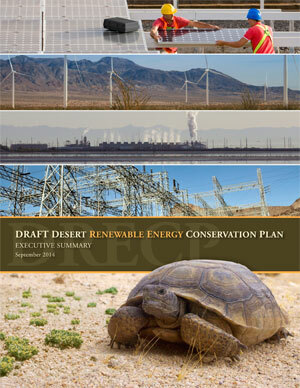 CEERT released a study on September 15th that quantified the employment benefits 19 large-scale solar projects totaling 7,737 MW would bring to the southeastern Mojave desert region of California. There are of course many desert regions in the world, but none other lies within 90 miles of over 12 million electricity consumers. The CSP (comprising “Power Tower,” “Parabolic Trough” and “Stirling Engine” technologies) and solar photovoltaic (PV) projects profiled in the report are highlighted in the map below. A variety of large-scale solar projects can boost economic development throughout southern California. The green jobs impact of these facilities were analyzed from several different vantage points. Since equivalent data was difficult to come by for the entire set of solar projects, the analysis looked at different groupings of projects to paint a picture of how many real green jobs these projects might deliver to the state’s economy within the next several years. For example, nine projects that totaled 3,484 MW — and which was dominated by parabolic trough CSP technologies — will create 4,632 jobs per month over the next three years (assuming all of them move forward according to current schedules.) A separate analysis of seven CSP projects totaling ~3,500 MW showed that the majority of employment would fall under the category of “laborers and assembly workers” (835), with the second largest category consisting of pipefitters, boilermakers and plumbers (598). Electricians (375), carpenters (319) and operating engineers (313) were also well represented. The length of construction supporting these job was estimated to last from 2 1/2 to six years. The report also drilled deep down into a single project: the 1 GW Bythe Solar Power Project in Riverside County, a facility that will be built in four stages of 250 MW a piece. Documented employment levels for just this one project will average 577 full-time employees over the next six years, with the work force growing to as large as ~1,000 workers during peak periods of construction. Perhaps most importantly, the solar projects profiled in the analysis are creating jobs in counties that sport some of the highest unemployment rates in California. As of July 2010, Imperial County — which has long been the poorest county in the state — was suffering from unemployment rates exceeding 30%. Riverside County’s unemployment rate stood at 15.30%, with San Bernardino at 14.80% and Kern County at 14.40%. The good news (in terms of sending the right signals to ensure these potential green jobs actually employ people) is that the California Air Resources Board (CARB) has moved forward with rules to implement a 33% Renewable Portfolio Standard on September 23rd, according to the Los Angeles Times. However, since the California Legislature failed to enact a law codifying the 33% RPS, many renewable energy firms are getting a little nervous, claims Reuters. Interestingly enough, with the polls showing a tight race, GOP gubernatorial candidate Meg Whitman finally came out against Proposition 23 on the fall ballot. This is the proposition financed by Texas oil that would suspend AB 32, the Global Warming Solutions Act of 2006. Nevertheless, Whitman still claims that if she was elected, she would suspend AB 32 under a different set of provisions — a move that renewable energy companies worry would sabotage California’s robust climate for clean energy technologies.